Home » Events and Blogs » Blog » Here’s why Hot Yoga enhances your life. Here’s why Hot Yoga enhances your life. Hot Yoga is a style of yoga based on 26 postures and 2 breathing exercises performed in a room heated to approximately 37 degrees. Yes, it can be daunting. Yes, it can be confronting. But you need it in your life. Hot Yoga works to detoxify your body. That is, removing harmful or toxic substances from your body. Having toxins built up in the bowels, liver and brain can make you feel depressed, lethargic, mentally foggy and may even lead to disease. The toxins in your body can cause indigestion and excess body odour. 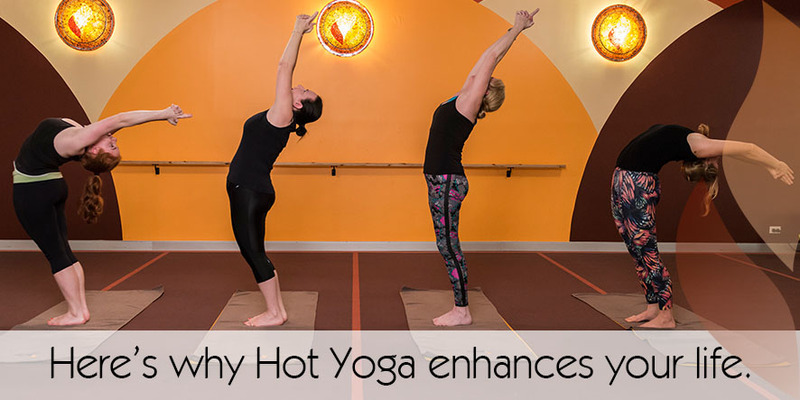 Hot Yoga is specifically designed to remove these toxins from your body through the heat – you will literally sweat out the toxins, making you feel lighter, clearer and healthier. Hot Yoga works to increase your flexibility, safely. The heated room and specifically designed postures allow you to stretch further and go deeper in to the postures. Being flexible can decrease your risk of injury, improve your posture, reduce lower back pain and increase blood flow and nutrients to soft tissues. Every Hot Yoga class will consist of the same 26 postures and two breathing exercises. This repetition and routine helps you to advance in your practice. You will gain focus and determination. You will learn to focus on the task at hand, and how to clear your head. In your work life, you’ll be more efficient. You will experience more calm in your personal life. It’s no secret that yoga is therapeutic. The purpose of hot yoga is therapy. With a regular practice, the postures can help to heal old injuries and prevent future ones. Hot Yoga is known to reduce the symptoms of conditions and illnesses including diabetes, asthma, high blood pressure, depression, arthritis and obesity. Hot Yoga is for every body. Age, size, shape, religion, belief; it doesn’t matter in the Hot room. Hot Yoga is all about you and the benefits to be gained from it. It can seriously change your life and your perspective. Those niggling aches and pains will ease or disappear. That feeling of not being able to focus will ease or disappear. The weight and burden of everyday life on your shoulders will ease or disappear. We all need Hot Yoga in our life. Try it today. Feel the difference today.